Paternoster for linoleum and carpet is already the must-have equipment for hypermarkets specialized in construction and utility. The automated paternoster is indispensable for its preservation of shopping and warehouse space, ease of management, speed of customer service. 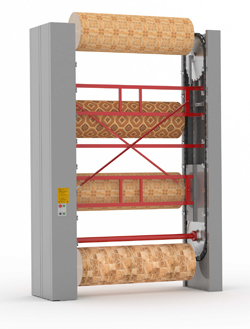 In addition to storage and demonstration of linoleum and flooring, paternosters are used in stores for cabling and wiring products or hoses. The automated paternoster is also successfully used in furniture production for vacuum forming to create a decorative coating for future products. This solution reduces the time required to replace the roll and does not require the involvement of additional staff. The tape is cut by an integrated manual knife. 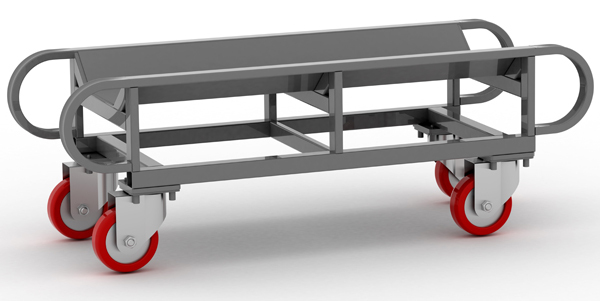 Now our company is underway to develop a series of paternosters for natural skin. The paternosters for the countertops are also at the design stage.